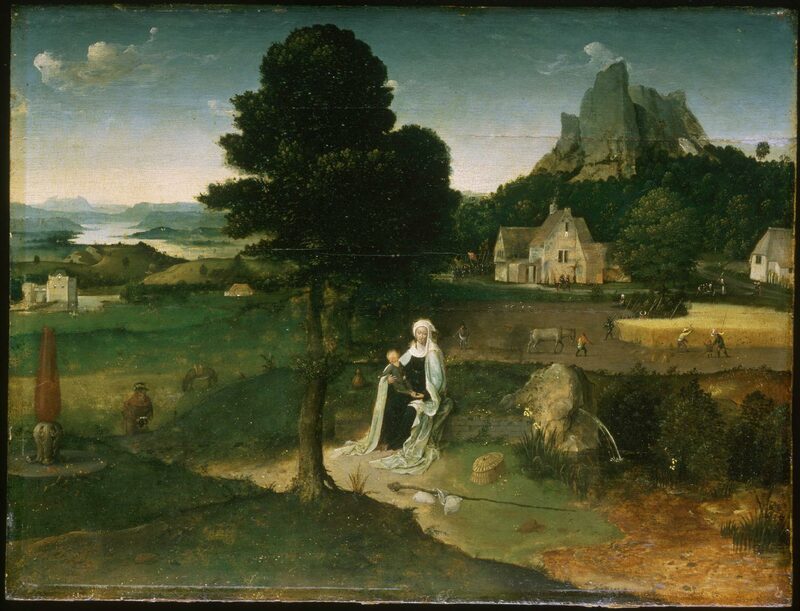 Patinir was one of the first artists to devote greater attention to the landscapes in his paintings than to the religious figures populating them. The broken obelisk at the left symbolizes the falling of pagan idols in the presence of the Christ Child. The field of wheat refers to the legend surrounding the Holy Family's Flight into Egypt to escape the soldiers of Herod. After the family passed a farmer sowing his wheat fields en route, the wheat miraculously grew overnight, and the farmer began harvesting it the next day. When Herod's soldiers came by and asked whether a family with an infant boy had passed, the farmer replied in honesty that they had done so when the wheat was being planted. Thus convinced of some months passing, the soldiers gave up their pursuit.